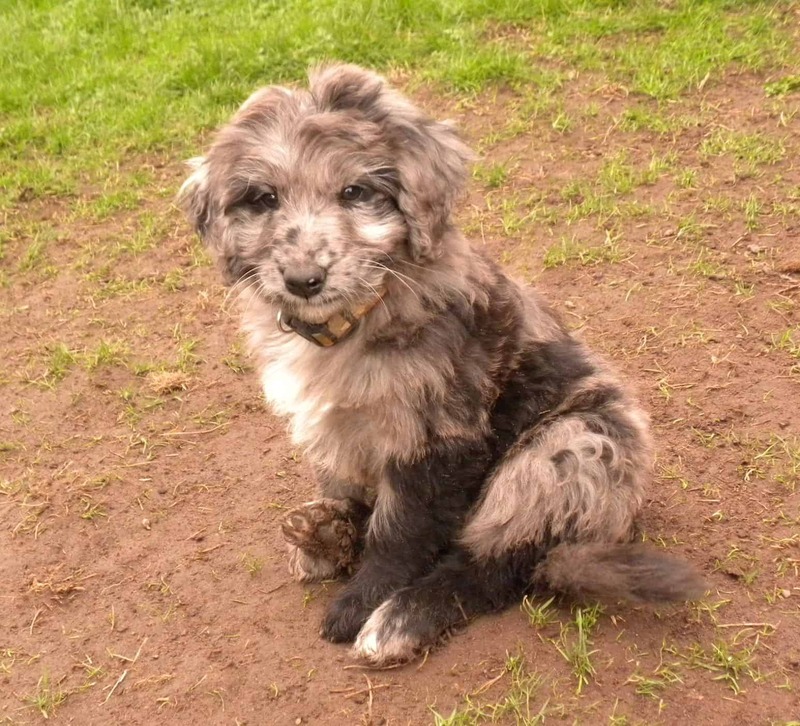 The Aussiedoodle is not a purebred dog, but a cross between the Poodle and Australian Shepherd. This dog can have desired traits from both breeds. The idea of crossing breeds with a poodle is not new and the reason is because of its non-shedding coat. It has gained a lot of popularity recently, most especially with those who are suffering from pet related allergies. Just like other crossbreeds, the Aussie Doodles have seen a recent surge in popularity. 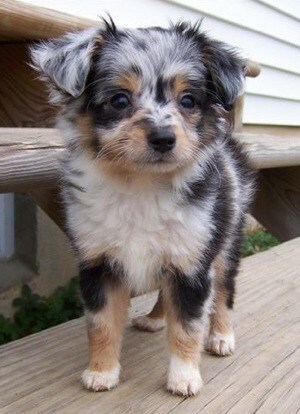 These breeds are also known as AussiePoo and are found more commonly in the United States than Australia. 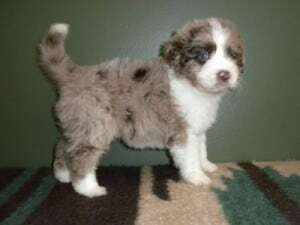 The size of the Aussiedoodle will depend on the size of the poodle and on the Australian Shepherd, who both contribute to the genetic heritage of the puppy. They feature coats with different colors that include varying shades of white, black and gray. As compared to the Australian Shepherds, the Aussiedoodles aren’t really as large, but most people find them a bit muscular. Their build is slender, but their bones are very strong. Their coats are soft, making them an amazing cuddling companion. When it comes to activity, the Aussie Doodles require moderate to high levels. They should always have regular walks or active playtimes every day if possible. This breed is athletic enough to participate in any sort of dog sports, as Flyball, agility, rally and obedience. If you want him as therapy, these dogs can give that to you. Keeping the AussieDoodle busy is always important. There are a number of activities that both of you can do together. Teach him to do some work that’s helpful to you, like bringing you some things, or helping you with what you do around the house. You should keep him busy, otherwise he’ll find a way to entertain himself and you will not like it. Training him to socialize early, while still using positive reinforcement techniques like playing, rewarding him with food and praising him, you’ll definitely have a wonderful companion. 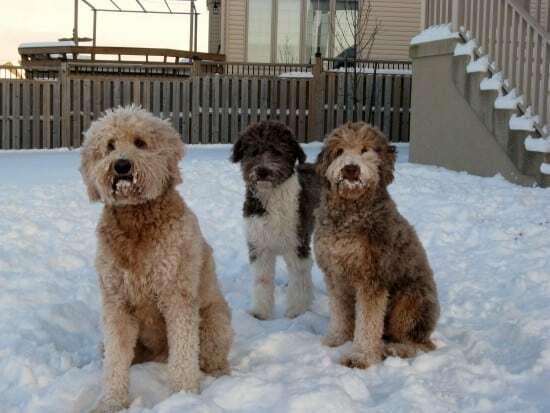 While the AussieDoodles have been known for their sociable and loving nature, they have also maintained their herding capabilities that are inherited from the Australian Shepherd. However, this doesn’t really indicate that they are suitable for herding as a job, but the owners need to be aware that they may have the tendency to do that sort of thing, especially if they don’t have the right training. Though these breeds could be devoted to their owners, they will not make for good watchdogs. Many people have been crossing different breed of dogs for many years in order to achieve a certain temperament, working history and look. That’s how the well-known purebreds such as Australian Shepherds, Affenpinscher, Black Russian Terrier, Doberman Pinscher, Black Russian Terrier and more were created. The only thing is that crossing two breeds over doesn’t make a breed. A breed is actually a group of animals being related by descent from the common ancestors and similar in most of the characteristics. In order to achieve the consistency in size, temperament and appearance, the breeders have to choose the puppies with traits that they want and breed them over for several generations for the traits to set in. For the last couple of years, crossbreeds have become a very popular choice, for the simple reason that people are looking for dogs that are fairly different from the Poodles or Yorkies, plus they often have certain appealing characteristics. 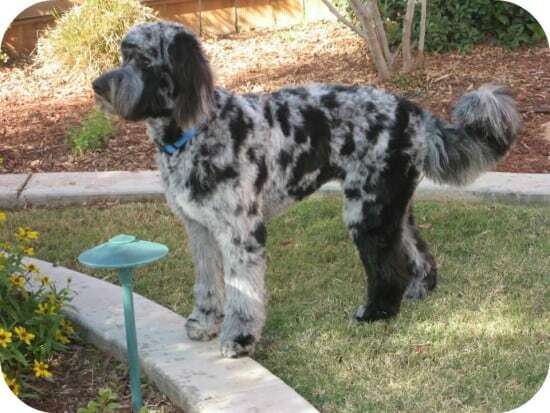 For example, it is claimed that some crossbreeds are hypoallergenic or have fewer health problems, or they can carry the best traits of the breeds involved. The Aussiedoodles are known for their intelligence and sweetness, plus they have an outgoing personality. These dogs could also interact well with other pets and are touted as being a wonderful choice for every family, as they have a lot of patience, especially for smaller children. The downside is that they will not make as good a guard dog, but in terms of companions they are among the best. Sociable, Aussiedoodles are totally known for their loving and sociable nature. They are quite easy to train because of their intelligence. Their endearing nature actually makes them good pets, especially for those who are looking for an awesome and loving companion. However, with this breed training is important, because they have behavior problems and love having a job to do, so they have the tendency to find one if they aren’t provided with one. Once trained, the Aussiedoodle will follow the directions provided by their owners, and they will do it well. They are loyal and will be content with playing with their owner or just lying at their feet. This breed could make an amazing companion for children. As mentioned, they have a good amount of loyalty and patience. The Aussiedoodle is considered to be more of a loyal dog and their owners mean everything to them. They are not an unfriendly kind of dog, but they can be trusted off leash and can follow their owners in a crowd, whereas a Goldendoodle could be just happy following anyone that is walking by. Aussidoodles are also playful. They have become very popular with the elderly and the handicapped. Generally, they are known for being a quiet breed. The only thing is that they aren’t suitable for apartments, not unless you are leading an active lifestyle. They need a daily dose of 30 minutes exercise by brisk walking, running, swimming or even with rigorous play with another dog if not with their human family. Since Aussiedoodles are crossbreeds, they are not registered with the major kennel clubs, because they are not purebred type of animals. Even when both of its parents were registered Poodles and Australian Shepherd, it would still be impossible to register the dog as a certain type of breed since they are crossbreeds. However, there are smaller registries, which have been developed for the hybrid dogs. On the other hand, Aussiedoodles are one of those dogs that do not experience a lot of health issues. Since they tend to carry their ears a bit higher than other crossbreeds, they are resistant to ear infection. However, they could also be prone to hip dysplasia. Thus, the prospective owners need to do some research in order to determine whether this would be a problem or not. Aussiedoodles need to be given to a healthy diet to maintain their well-being. As an owner, you should provide them with regular checkups as well as a healthy diet. Twelve to fifteen years is the average lifespan of this awesome breed. 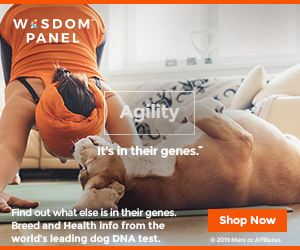 Now, dogs, regardless of their breed have the potential to develop any sort of genetic health problems. Getting to breeders who don’t offer you any sort of health guarantee on the puppies, a person telling you that mixed breeds are completely healthy and that they have no known problems, that’s usually not a good idea. A reputable breeder should be honest and open about the health problems in crossbreed dogs as well as the incidence for which they occur. The Aussiedoodles could be vulnerable to health problems from which its parents are susceptible too. The only thing is that, there’s also a chance that a diversity in the genes of mixing two breeds could lower the chances of developing inherited diseases. The very nature of genetic variation makes this a bit difficult to perfect for crossbreeds. In a growing pup, these conditions aren’t really detectable and it’s quite impossible to predict whether an animal will be free of any ailments. Thus, finding a reputable breeder, who is also committed to breeding those of the healthy animals, is essential. They need to produce independent certification that the parents of the dog have been screened for the common defects and believed to be healthy for breeding. Keep in mind that Aussiedoodles need regular exercise. They are energetic kind of dogs and need plenty of space to run or long walks. Training them to socialize at a very young age is ideal. Since the Australian Shepherds are herding dogs, they bark, so the Aussiedoodles can do that too. They are the kind of dogs who get excited by almost everything. Whenever they get too excited, they will bark until they calm down, so training at an early age is essential. On the other hand, when it comes to health issues, the Aussiedoodles might suffer from problems that are also common to their parents. They could suffer from elbow and hip dysplasia, allergies, ear infection and might inherit issues that could cause deafness or blindness. They can either inherit the health issues from their parents or not. Since Aussiedoodles have different types of furs, there are ones with long, straight or loose curl. You should understand that they are high-maintenance kind of dogs when it comes to grooming. The dog will require a grooming that includes regular nail clipping, brushing the coat every other day and in case you have a curly furred Aussiedoodles, you may need to have their fur clipped. The Aussiedoodles have to be taken to the vet on a regular basis in order to receive vaccinations, so they could ensure that their pets remain healthy and free from any illness. Owners need to know that this kind of dog needs regular grooming to maintain a clean appearance. If you’ve got an Aussiedoodle, then you need to learn how to care for it, the kinds of foods that are appropriate in its case, the accessories that work best for a dog of this size and so on. We’ll get you started here though, with a couple of suggestions. First of all, this is most likely a medium sized dog. The dietary requirements for such a dog can be met very well by using some of the recommended foods from this article. For now though, you have below a complete list of products that are great for adult Aussiedoodles. I’ve chosen only the best products from each category for this list. 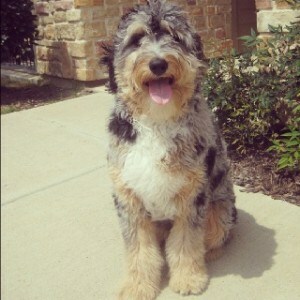 If you are thinking about getting an Aussiedoodle, you need to know if this is the right kind of breed for you. To help you out, you need to find the right breeder who can provide suggestions and information you need to know. Although Aussiedoodles are playful, full of patience, loyal and active dogs, it doesn’t necessarily mean that they are suitable or good enough for you. A good breeder is the only one who could help you find the right puppy for you. So, what is he going to do? Well, he’s going to match you with the right puppy and will provide you with all of the health certifications you need to screen out health problems. A good breeder is a lot more interested in giving puppies to responsible prospective owners instead of making money. One of the reasons why Aussiedoodles are popular is that they are adorable. Keep in mind that cute puppies do sell and these puppies are favorites of mostly irresponsible breeders. However, you should know that there’s no need for you to pay a lot for this kind of dog. You could just as easily find amazing examples of such dogs at the local shelter or through adoption organizations. 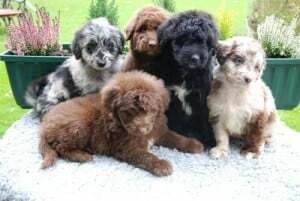 If you think about buying an Aussiedoodle, choosing the right breeder who can provide you with the health tests that the dog has underwent would be ideal. It only proves that the breeder is not all about the money, but the safety that both the family and the dog will have. While there are no guarantees in life, it’s also a very good way for you to minimize the possibility of bigger vet bills in the near future. Since you’re looking for the right breeders here, make sure that you avoid those that are only thinking about unloading a puppy for you. You need to remember that buying a puppy from websites offering to ship that dog to your could be a risky decision. This is the case because it leaves you no option if you get something that you really did not expect. Put a bit of effort into doing your research, as it will help you to save money in the long run. 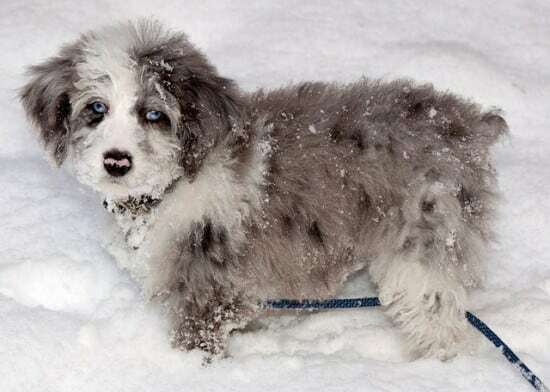 Prior to deciding to purchase a puppy, you need to know whether getting an adult Aussiedoodle could be suitable to your needs and your lifestyle. The puppies could provide you lots of fun, but they need more time and effort before they grow up and become what you have dreamed him to be. Whereas, adult Aussiedoodles are already trained, they could be less destructive, active and demanding, unlike what puppies mostly are. 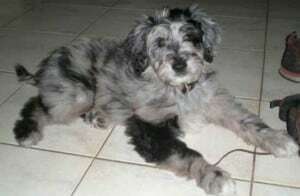 Looking for an Aussiedoodle? I suggest you check out DreamyDoodles. You have 7 days to remove the photos of my dogs or I will have my lawyer contact you for copyright infringement. You can either link my website or you can remove them completly. That is so uncool and as a web designer myself…. I already know that you also know better… I should not have to explain myself as to why this is so wrong and why it’s also effecting my business that I have put years of hard work into. You have 3 pictures of my dogs in your Aussiedoodle gallery. If you wanna know which ones I guess you can contact me. Giving you the benifit of the doubt to do the right thing here…. Please do. Hi Barbara. I sent you an email and I added a link at the end of the post. If you’d prefer the link somewhere else, let me know.